Prominent & Leading Manufacturer from Sahibabad, we offer chipper knives. Over the period of time, we have attained a prominent stature in the countrywide market, which is engaged in manufacturing superior quality Wood Chopping Knives. 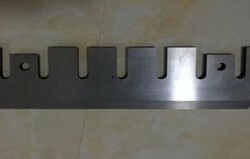 Excellent quality chipper knives manufacrured from imported steel .